The important new medical research study described in the article below is funded through the Gulf War Illness (GWI) Congressional Directed Medical Research Program (CDMRP), which must be specifically funded by Congress each year in order to continue. Dr. Terry's study, "Organophosphate-Related Alterations in Myelin and Axonal Transport in the Living Mammalian Brain," was funded with FY11 GWI CDMRP funds. At the end of an arduous sifting and winnowing process, the well qualified proposals that made it to the final stage of evaluation totalled nearly $31 million. With just a Congressional appropriation of just $8 million, only six were able to be funded, including Dr. Terry's important study that, if successful, will help identify specific targets for treatment. This year's appropriations process is already underway, and the Gulf War veteran community is seeking $25 million in GWI CDMRP funding for FY13, a substantial boost from FY12's hard won $10 million. It will take substantial effort from the veterans community and allies in Congress to win this year's uphill struggle. This article is from The Augusta (Ga.) Chronicle. The memory and attention problems plaguing thousands of veterans from the first Gulf War might be caused by low-level exposure to insecticides and nerve gas, said researchers at Georgia Health Sciences University. Dr. Alvin Terry, a professor at GHSU, and his colleague, Dr. Nathan Yanasak, are conducting a three-year study on the neurological symptoms of Gulf War illness. 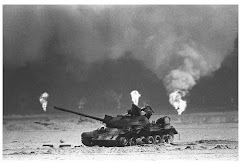 Gulf War illness could be caused by a class of chemicals known as organophosphates, which can include popular pesticides and insecticides but also the nerve gases sarin and cyclosarin. 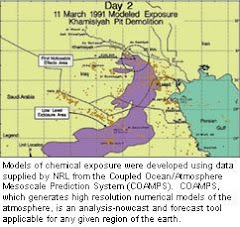 The Department of Defense and the Central Intelligence Agency estimate 100,000 people might have been exposed to low levels of those nerve gases when troops blew up a weapons depot in Khamisiyah, Iraq, on March 10, 1991. Troops were also routinely exposed to the chemical in insecticides, said Dr. Alvin Terry, the director of the Animal Behavior Center at GHSU and professor of pharmacology and toxicology. Terry and a colleague, Dr. Nathan Yanasak, have an $860,000, three-year grant from the DOD to study whether the chemicals can cause nerve damage in the brains of animals – in this case, mice – that could lead to memory and attention problems. They will look to see whether the insecticide chlorpyrifos, which is commonly used on crops in the U.S. and around the world – when given in low doses – might hamper the ability of the nerve cells to transport food and waste up and down the nerve. “For it to maintain its health, it has to be able to transport things” along the axon of the nerve, Terry said. The researchers are using newer technology, such as manganese-enhanced MRI, to study that because manganese is known to be taken up and transported by nerves in the brain, he said. Researchers will also check whether the protective sheath of the nerve cells, known as myelin, is depleted by the low-level exposure, which can affect nerve firing. “It’s probably subtle if it is there,” Terry said. In previous work, including a study published this year, Terry and colleagues showed that “subthreshold” doses of the chemical caused memory and attention problems in rats even months later. “Long after they have been exposed, you can still pick up on these memory deficits,” he said. What makes that intriguing is that it is similar to problems that plague veterans with Gulf War illness, Terry said. The study in animals is is being done to find out whether that is the cause of the symptoms, which could stem from a number of other causes, such as the oil well fires that raged during the conflict and had wide exposure, Terry said. His work has drawn some fire from chemical companies, but Terry said he strives for balance in his view of the chemicals.